Are you over placing masking tape on carpet and it only lasting for a day or so? Well this was constantly happening with me, especially with robotics club. Students were with me for a whole lunch and by the time they made their tracks and had a few turns with the robots it was the end of lunch. I needed to find a solution…..
My tech partner and I are presenting at the Inspire Innovate Conference on April 11th. We needed to find a solution to replace masking tape as we wouldn’t have enough time to set the tracks before our workshop. We looked around for rugs and found the one below. This is great for classrooms as it will stay in one place, but it is quite heavy if you need to carry it from one classroom to another. We definitely couldn’t take this to the conference, so we needed a solution, fast! We decided to purchase material from the material store down the road. We drew basic road tracks for one of the materials. We realised the entire section of the material needed to be painted so it wouldn’t crinkle then the robots turned. We used our other materials to create a range of tracks for students. My tech partner designed the next one on a whiteboard. I believe it is a good idea to plan out your ideas first before drawing it on material. We used school poster paint to paint the entire area of the material. The reason we painted the whole material was that the material was crinkling when Dash would turn. By painting the entire material, it allows Dash to drive and turn smoothly. HINT, HINT!! I’ll be sharing more photos of the other mats which we’ve created for the conference. I hope this inspires you to explore cost effective and creative options. You don’t need to spend big to get a great outcome! As you might have read in my previous post, my school purchased 20 Dash robots so each stage could have 5 each. I looked a range of safe storage options that were cost effective. Unfortunately Wonder Workshop don’t sell carry cases, so I began looking on eBay and Amazon for carry cases. I found some from Amazon but it would end up costing around $60-80 each and would cost a fortune for 20 Dash robots. I explored other avenues like suit cases/luggage bags. After shopping at Strandbags for suit cases to use to transport our robots and materials for the Inspire Innovate Conference, I decided it was the best option. My tech partner and I looked around for cheap, reliable suit cases and found some at Big W. As you can see, we purchased 4, 1 for each stage. We also purchased mattress protector foam to place on the bottom of the suit case to provide some protection to the robots. We chose to buy this instead of purchasing expensive foam from Clark Rubber. Once the cases were ready to put the Dash robots in, it was obvious that we needed something to protect the robots from bumping into each other and avoid having them get damaged or scratched. After brainstorm ideas, we thought beanies would be a cost effective solution. We found 20 thick beanies from Kmart for $7 each which worked a treat! Finally, I added the 5 chargers, 10 building brick connectors and manuals. The kits were completed and ready to be given out to stage leaders. As with any other technology in the school, we need to keep a register of who borrows out the robots. Each stage leader was given their own booklet to borrow robots out to their stage. It is a good idea to have a borrowing system for any technology in the school but especially robots. This makes teachers accountable for these devices. Robots don’t need expensive, fancy cases. Explore online for cost effective solutions like we did. The price different was amazing! Hope this helps give you ideas if you are thinking of the best way to store your Dash robots. In Term 3 2017, Fairfield, Guildford and St Johns Park Public schools had a VIP Mini COS day at Fairfield Public School. 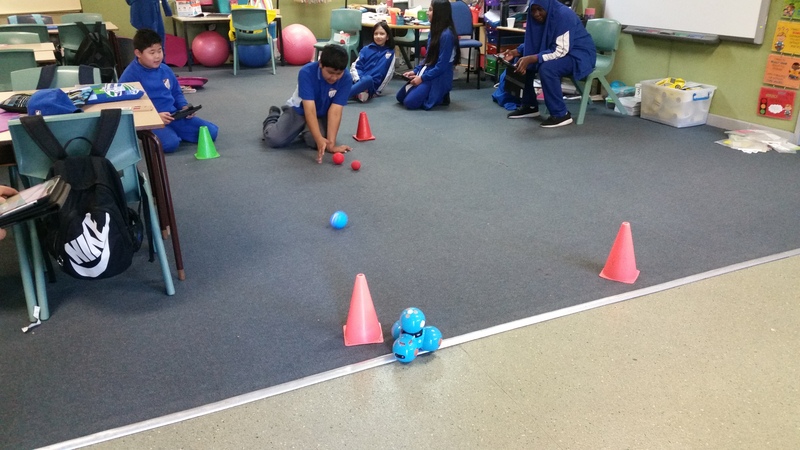 We presented a hands on workshop on robotics in the classroom, showcasing the Dash, Sphero and Ozobot robots. The purpose of this workshop was to introduce teachers to robots as part of my future focused direction for the school and for myself. 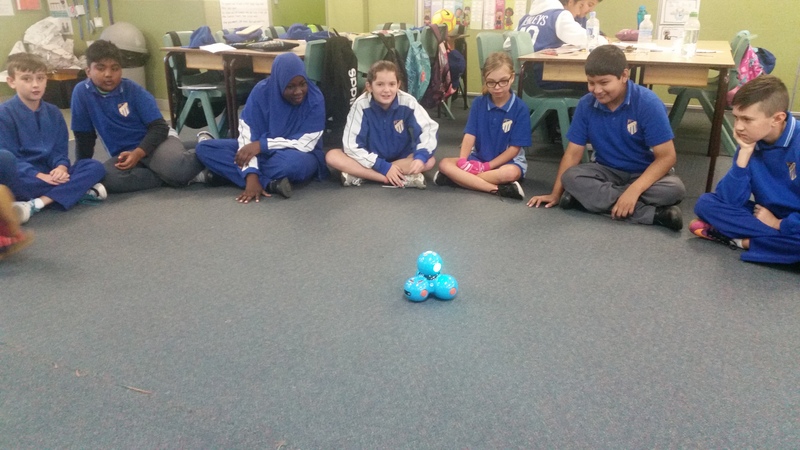 We explained the benefits and KLA links of using robots in the classroom and then allowed teachers to rotate around groups to explore the three robots. Teachers had a go exploring the 3 robots at our rotation stations. What a great way for schools to experience PL through the community of schools network. 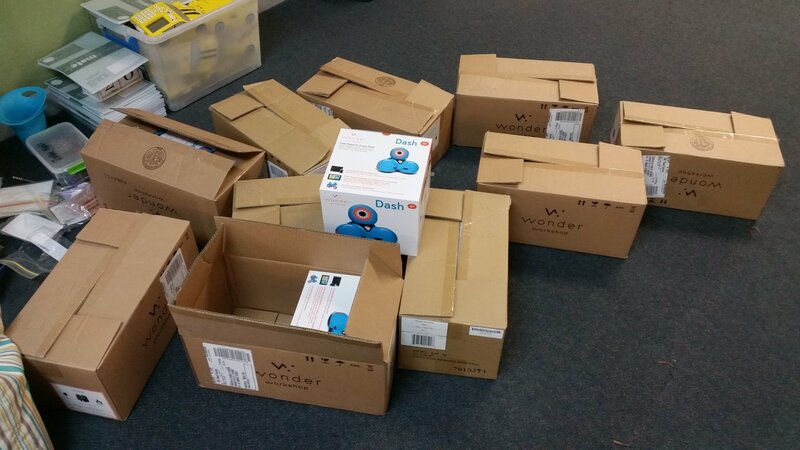 My school recently purchased 20 Dash robots so classes can implement STEM projects and coding in their classrooms. I’m passionate about future focused learning and couldn’t think of a nicer way to engage students in learning using tech. I am absolutely excited to finally have these robots in my school. My plan is to have 5 robots for each stage. My journey started in 2015 when I was interested in purchasing these after seeing them online. My principal asked for a demo before purchasing but because of the busy end of year, it occurred in 2016. Jason from Modern Teaching Aids came in to demonstrate these robots using the iPad apps ‘Blockly for Dash & Dots robots’ and ‘Go for Dash & Dots robots’. He was nice enough to allow me to borrow the robots for a few week to test it out with my students to see if they would like it. Finally in 2017 we purchased 20 of the Dash Robots without Dot as it came in an educational pack. The unfortunate part for me was that these arrived a week before I was to go on leave for surgery. Therefore, I wasn’t able to run professional learning for staff and hand these out to be used in term 2. I will be presenting robotics in the classroom for staff development day in term 3. I’ll also run some professional learning and in class tech support for classes who want implement these robots into their learning. 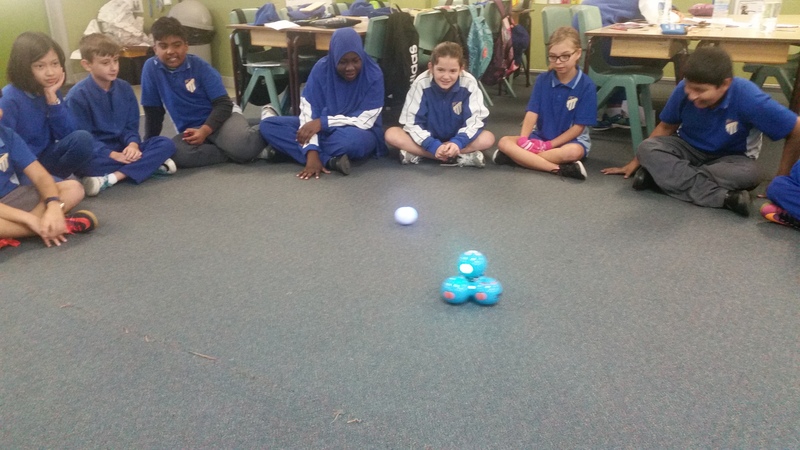 We introduced Dash to Tech Club students as we have entered the ‘Young ICT Explorers competition’. They love Dash and can’t wait to use it for their STEM project for the competition. I’ll be blogging more about this throughout our journey. 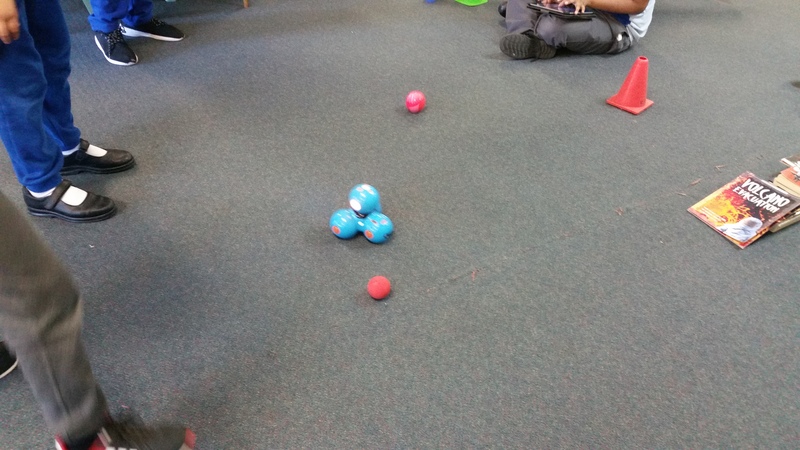 On my last day with them, students separated into groups where some used Dash and others used Sphero robots. They were given free choice to be creative with the robots. The group with Dash beamed with excitement as they versed Sphero in a soccer match. This is just the start, I can’t wait to see what amazing things they do once I’m back and are given more time to plan and explore. I can’t wait to introduce this to staff and students. I’ll blog about our use with the robots as well as instructions on how to use Dash. Students engaged in using #GarageBand. Using #GarageBand to create music. My class and our buddies worked on their song for the school bell competition. The 3 tiered containers from discount stores are great to store #Microbit. Testing out the #Microbit with led strip and ultrasonic sensor. Earned all badges for Apple Teacher and Apple Teacher with Swift Playgrounds recognition. Now I can add Apple Teacher with Swift Playgrounds recognition to the list of accomplishments. Ticking off goals.